Just like the new version of Word, Excel opens with a Start Screen, where you can start a new blank workbook, create a new spreadsheet based on a template, and open an existing Excel file. 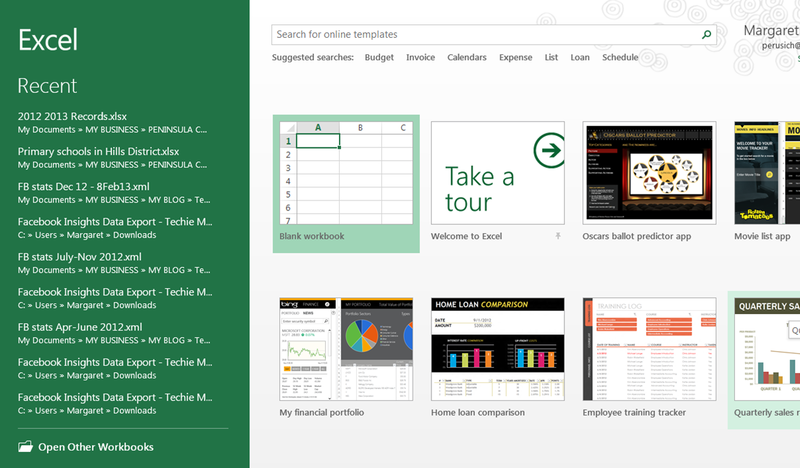 At first glance Excel 2013 looks the same as 2010, just with some slight cosmetic changes to the Ribbon. What is hidden is that Excel is now even easier to use with lots of intuitive tools – here’s just a few of them…. In previous versions of Excel you had to decide which chart you wanted and switch between each before you found the right one. 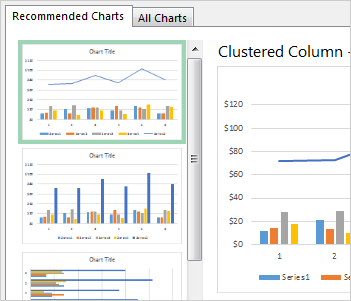 Excel 2013 has a great new feature for those who are a bit confused by all the different styles of charts – Recommended Charts. Just select the data for the chart and click Insert > Recommended Chart to see the different options that would suit your data. Click each chart to preview what your data will look like in that style. Once you've chosen your preferred chart, small icons will appear outside the top right corner when you select it, giving you access to tools for working with the chart’s elements, styles, and colours. In Excel 2013 each workbook opens in its own window, which makes it much easier if you often work on two or more workbooks at the same time. If you’re not sure what’s the best way to display your data so that it shows what you want, Quick Analysis should help you decide. Just select the cells that contain the data you want to work with, then click the Quick Analysis button that appears next to your selected data. Depending on the type of data, you’ll be given a choice of different options for displaying that data. Would you like to display your data as a chart or a table; would you like to change the format to show colours; the top or bottom 10%? Just select the option you want, or point to it and you’ll see a preview. If you've ever struggled with Pivot Tables, Excel 2013 makes it so much easier with Recommended Pivot Tables. Just select your headings and data, then Insert > Recommended Pivot Tables. You’ll be shown a series of Pivot Tables with explanations of what they show. You just need to select the table that shows what you want to see, click OK, and your Pivot Table is automatically drawn for you.